Build Your List By Helping Others Build Their Lists. Get More Orders By Helping Others Get More Orders. Every business owner wants more optins. Every business owner wants more orders. It is a universal reality that applies to every niche for every type of product in every corner of the digital world. In order to be in business, you need an ever-growing list of prospects who place orders to buy your offers. Not every business owner wants to blog. Not every business owner wants to host webinars. Not every business owner wants to run pay-per-click ad campaigns, get a bunch of social media followers, speak at conferences or participate in a variety of other business-building activities. to join their lists and buy whatever it is they are selling. You’re one of them yourself. 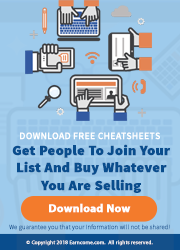 12 Cheat Sheets That Show How To Get More People To Join Your List And Buy What You Are Selling. 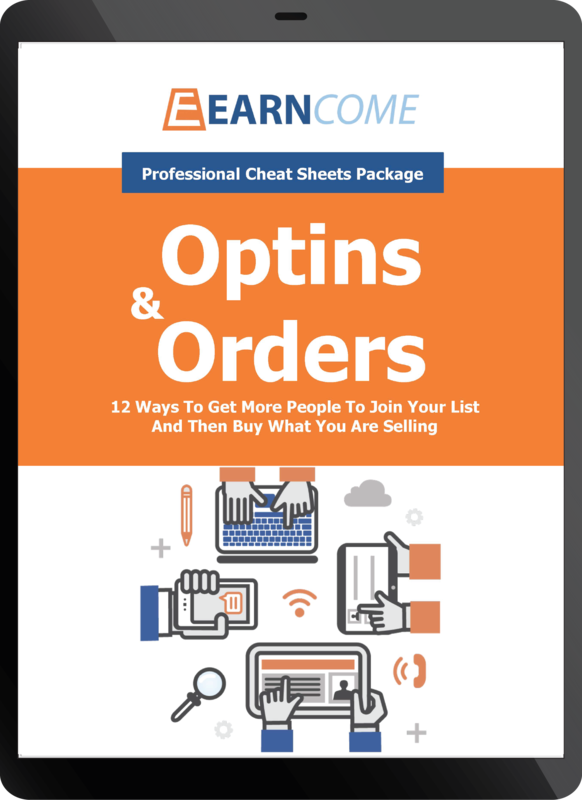 Optins And Orders is a set of twelve single-page cheat sheets that provide a highly-detailed overview of how to create and profit from the most popular types of lead magnets. Lead Magnet Defined: A lead magnet is something of value (cheat sheet, document, report, checklist, etc.) that you give away to get people to join your list and then use to presell those people so they buy your product). PLR (private label rights) licensing to sell the Optins And Orders cheat sheets and guides for $19.97 per order, or give away parts/all to build your list. 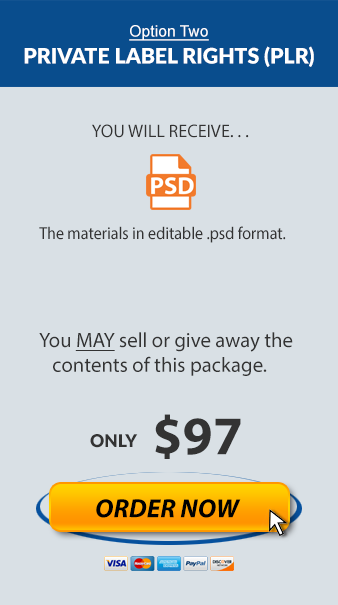 The source files for all twelve cheat sheets in .psd format to insert your logo and recommended resource advertisement in the footer area for backend order sales. A beautifully designed landing page in .html to give away parts of Optins And Orders to build your list (see suggestion below for how best to do this). A salesletter in .docx format to use as best fits your website design (or you can simply insert it into the landing page design and use that as a template) to sell Optins And Orders and keep 100% of every order you receive. Three promotional banner image source files in .psd format to add to your blog, webpage, advertisements or other spaces to promote Optins And Orders. What’s Included In Optins And Orders? NOTE: Download A Free Cheat Sheet Below To See Exactly What Is Included. The twelve cheat sheets in Optins And Orders are beautifully designed and truly one-of-a-kind in nature. There is no question that your prospects and customers will want to grab a copy of them simply for their visual appeal. But, as much as they shine in appearance, the real value is in the quality of the content presented in the cheat sheets. 1. Tips And Shortcuts. Each cheat sheet begins by revealing 3-6 insights that are specifically applicable to the type of lead magnet being focused on. 2. Titling Templates. Next, there are 3 “fill-in-the-blank” templates for creating an appealing title for this type of lead magnet, as well as examples. 3. FAQs And Answers. Following the templates are 2-3 of the most commonly asked questions about this specific type of lead magnet, along with an easy-to-understand answer. 4. Chronological Steps. 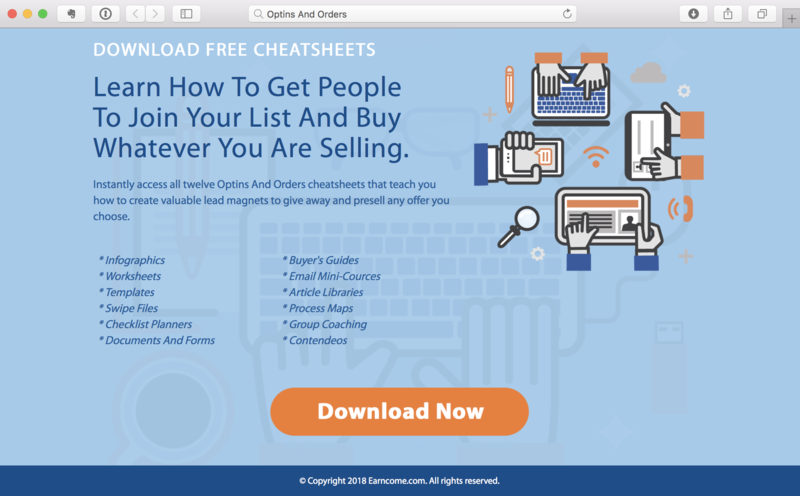 Finally, the cheat sheet details 3-4 steps to complete in order to create this specific type of lead magnet. Many of the steps also have bullet points for clarity. Please take note of the word “specific” in the above description. Each type of lead magnet has specific tips, templates, FAQs and steps that apply. There is no “one size fits all” grid for the various types of lead magnets, so we make certain you get the information you need for each unique piece of content. As you can see, this type of content is just perfect for the “100 out of every 100” reality. This is just the type of content your prospects and customers will love. And that’s why this PLR package is such a smart investment for someone like you. Infographics and cheat sheets condense a lot of information into one easy-to-consume sheet. 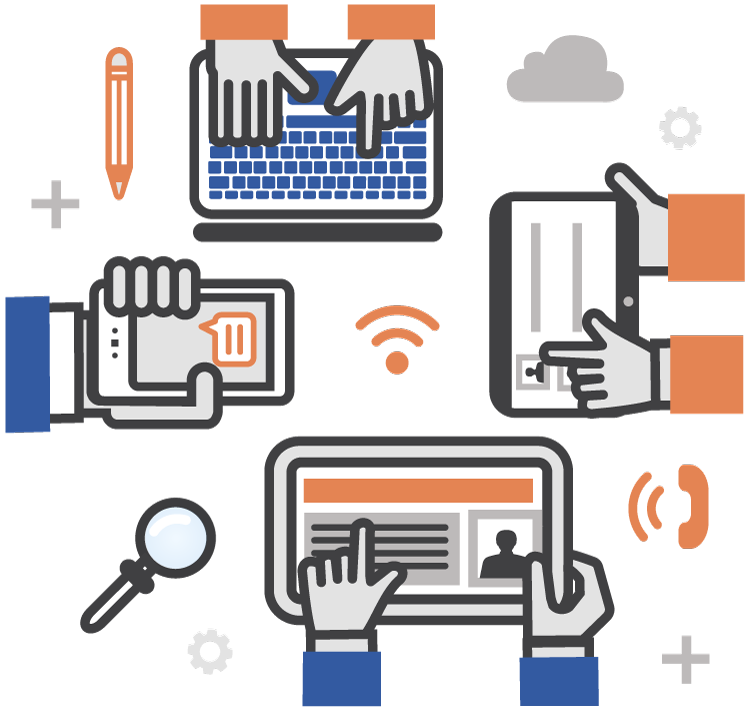 By combining content with an attractive, visually-appealing design, you can quickly create a one-of-a-kind, highly valuable resource that people refer to over and over. Worksheets engage your prospects and get them thinking about their desired results which your paid product delivers. When you design a worksheet that helps people assess their needs, brainstorm ideas, and loosely work through a process, it’s easy to point them to your product as the ultimately solution. Templates are fill-in-the-blank tools that prospects can immediately use to create results, making them very popular for prospects and very profitable for you. When you provide templates to your prospects, you’re giving them a “shortcut” to speed up the process they are working on. A checklist planner gives the reader a step-by-step, day-by-day guide of what to do to complete a task or achieve a goal. You can create these on just about any imaginable topic in every niche to provide a highly sought after resource that is “ideal” for connecting to a paid product. Documents and forms (such as leases, coaching questionnaires, exams and tests, or job applications) are high-value items that prospects love because they save time and money by using them. By providing this “done-for-you” resource, you are certain to have more people in your niche scrambling to join your list. 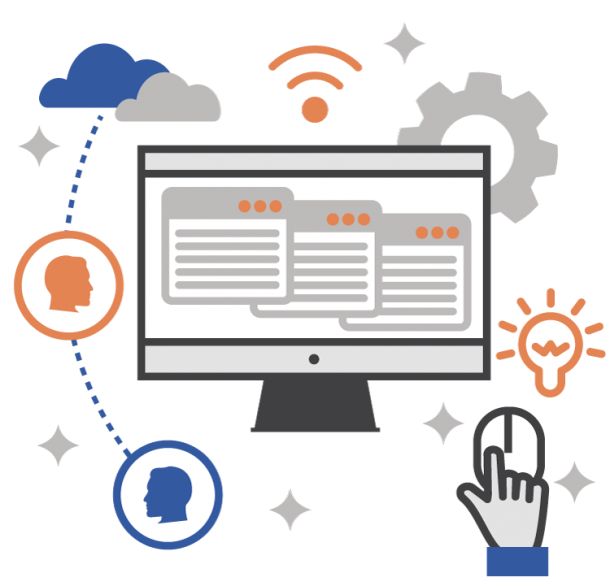 A buyer’s guide provides product research, reviews and opinions in one place to help buyers make a decision about a specific type of product. You can help other people choose the product (digital or physical) that is best for them while generating orders for your products and commissions for third-party product referrals. An email mini-course is a series of 5-7 lessons consisting of a blend of free content and pitch for a paid product. Delivering a mini-course by email gives you multiple chances to get your links and calls to action in front of your audience, which results in higher conversions. A swipe file or tips list provides users with a collection of proven ideas and examples that they can put to work to get a desired result. Tips lists (Ex. 44 Ways To Lower Your Golf Score During Your Next Round) are some of the most viral content on the Internet because they are uber-appealing. A contendeo is a content video that first shares one big idea or teaches one topic to viewers, and then sells a related product at the end. It is longer than a brief “explainer” video and shorter than an in-depth “webinar” video. Process maps and mind maps present information in a non-liner and visual format which many users prefer. Similar to how a map of a city allows you to better understand driving instructions, process maps and mind maps provide a structure for visualizing information for greater clarity. Group coaching (Q/A sessions) carry a high perceived value and really showcase your expertise for a specific subject matter within your niche. Because of these, group coaching (whether presented in text, audio or video) leads to a high conversion rate on the backend. Article libraries provide information about a series of related topics for easy reference and consumption. As the name suggests, this is a collection of articles (in varying formats such as how-to, list, FAQ, etc.) for reading, study and reference. Now let us be clear about what these cheat sheets are, and what they are not. These aren’t complete, in-depth instructional manuals for those twelve types of lead magnets. In each guide we’ve condensed the creation of these lead magnets into the most important points, tips, and steps. They are not exhaustive, comprehensive training courses. They are what you “need to know” and no extra fluff and filler. includes is to see exactly what one of these cheat sheets includes! * Give away ONE of the single-page cheat sheets by itself. * Give away ALL TWELVE of the single-page cheat sheets. NOTE: We recommend you go with option one and this is what we did in giving away The Checklist Planner Cheat Sheet combination above. 2. Sell The Entire Optins And Orders Package For $19.97 Per Order. We recommend that you give away a “splinter” as mentioned in number one and then promote the entire Optins And Orders package on the backend of that giveaway. 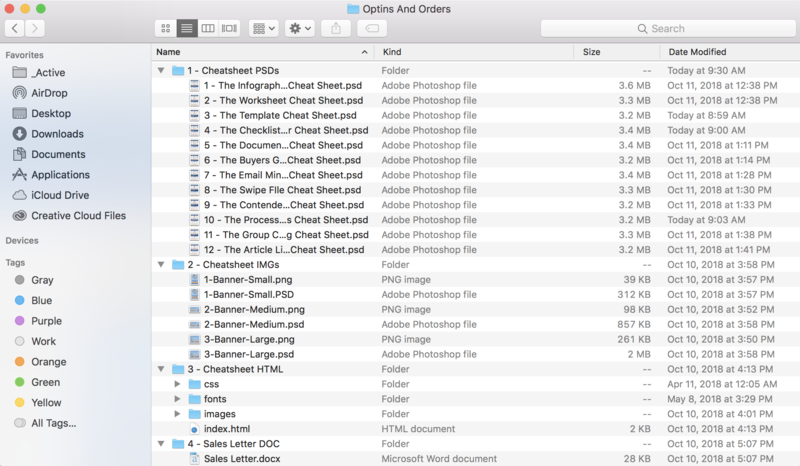 We suggest that you sell Optins And Orders for $19.97 for the twelve single-page cheat sheets. But you could also easily sell it as a low-cost “tripwire” product for $7 for ultra-high conversions and sell more on the “backend”. 3. Backend Other Related Offers In Your Free And Paid Offers. Each cheat sheet has a footer advertisement space where you can embed a related offer of your choice to earn backend profit. Of course, you can change up the design, add/tweak content, insert your own logo, change colors, add other banners/buttons, etc. 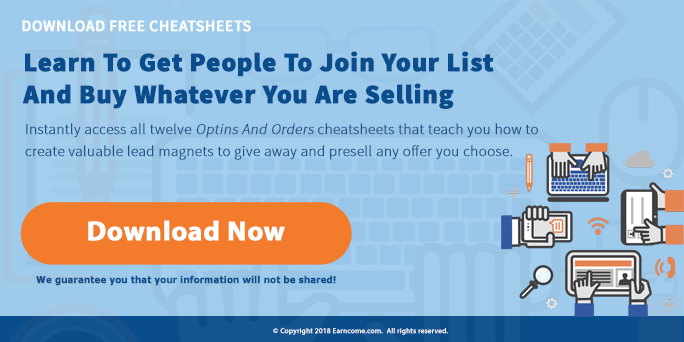 Build Your List With Optins And Orders. Sell Optins And Orders For $19.97 Per Order. If you hired someone to research and write the content, create twelve infographic cheat sheets, design a landing page and promotional images, and write a professional salesletter to do this yourself, you can expect to pay $1,000+. Good copywriters charge more than that for the salesletter alone! that PLR licensing to Optins And Orders is only $97. PLR (private label rights) licensing to sell the Optins And Orders cheat sheets for $19.97 per order, (or as a low-cost $7 entry level offer) or give away parts/all to build your list. The source files for all twelve cheat sheets in .psd format to insert your logo and recommended resource advertisement, and use in virtually any way you want. A beautifully designed landing page in .html to give away parts or all of Optins And Orders to build your list. 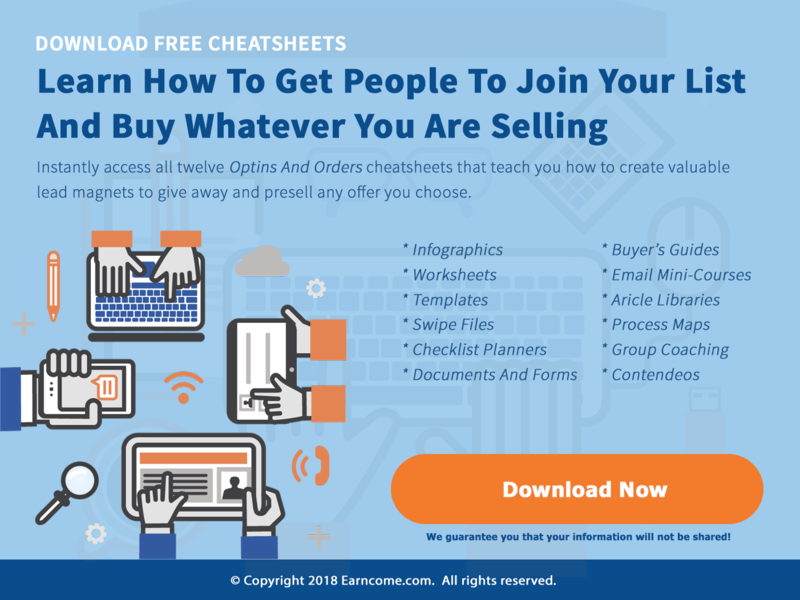 A salesletter in .doc format to use as best fits your website design (or you can simply insert it into the landing page design and use that as a template) to sell Optins And Orders and keep 100% of every order you receive. UPDATE: Not interested in PLR for Optins And Orders? Want a copy for yourself? You can purchase a “personal use only” version of just the cheat sheets in .pdf format. Print them out and use them yourself, but you can’t share them with others or sell them.